Ellie says "Absolutely too early too get up!" Our Ellie is 21 months old. 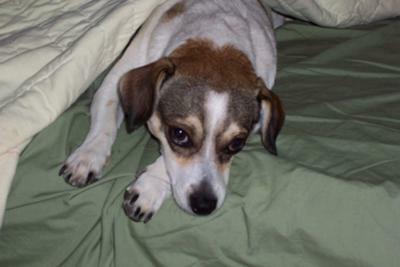 Not full blooded Jack Russell but Jack and Beagle mix. She was 10 weeks old when we got her from a friend. She is now fluctuating between 16 and 19 pounds. It depends on how much we get too walk. On good days, weather permitting, we walk 3 miles. We try not too miss a day for she loves walking. She is the joy of our lives. She learned obedience very quickly. Several tricks she can do. We have taught her too Shake hands for treats, beg for treats, sit for treats, roll over for treats, crawl for threats, dance for treats...lol... A dog never worked so hard. However she will also do some of these tricks without the offer of food when we ask her. She is an amazing dog.